This statement has been used to promote fringe beliefs for some time now. Most recently by a UK government official to support incorrect knowledge about science. The reason that they are students is because they don’t have the knowledge, skills, and training to really make up their own mind… yet. This particular discussion was about evolution (naturally). What that particular Member of Parliament was saying is that a student has or will get all the knowledge that they need to draw a valid conclusion about evolution in their school. Of course, this particular statement was in support of a teacher who thought that “evolution is only a theory”, so those students are likely to not get correct information anyway. But, think about this a second. 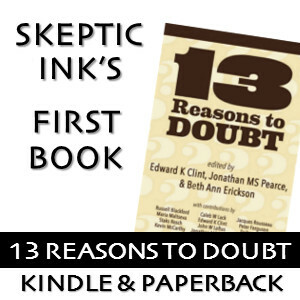 I’ve been writing articles on evolution here at Skeptic Ink for 3 years now and in other blogs for almost a decade. Sure, I’ve repeated a few concepts but I’ve never really talked about the details. I’m working on a book on those details. I’m over 70,000 words in and basically finished explaining how genetics actually works. Just reading that out loud to students would take days (at 1 hour per day) and schools typically devote 2-3 days to evolution. It’s not possible for a student to get sufficient information to make up their mind about an exceedingly complex topic like evolution (or cloning or abortion or religion) in a typical secondary school classroom. This will be a difficult thing to express, but work with me here. Students, even sophisticated high school students, are very susceptible to authority. They have lived their entire life, to that point, being told what to do and how to do it. They are told by an authority figure when to get up, when to go to bed, what to eat, when to eat, when to play, how to play, etc, etc, etc. They trust those authority figures. Their parents, their priest, their teachers. They have been told those people can be trusted. Which is one reason it is so easy for those people to abuse that trust. People like priests and teachers often want what’s best for the child, but the problem is that they don’t know any more than the child about what is correct in the real world. That is why we fight so hard against religion, creationism, and other pseudoscience in schools. Because children are so susceptible to it. I know how hard it is to be a teacher and have an entire class tell you they will not accept evolution. It’s not because they have made up their own minds. It’s because others have made up their minds for them. And the students don’t realize it. The really bad part is that so many adults have been indoctrinated in this way that they cannot question authority. They cannot perform basic critical thinking tasks. And they spend their entire lives paying $35 a bottle for homeopathic remedies that are just bottle water. They spend their lives fighting for belief over facts. And they raise their children the same way. There are very few children or adults, though the number seems to be growing, who can overcome that indoctrination. It takes a great deal of mental and emotional strength and courage to actually learn the real science and the real facts and reject the misinformation that those trusted authority figures have told them their entire lives. And more importantly, to take a closely held belief (no matter how acquired), examine it carefully, and throw it out when it is found wanting. All of the creationists I know of have the same problems… and these problems are universal among fringe beliefs. 1) They do not accept facts as facts. 2) They refuse to examine their chosen belief with the same scrutiny that they examine material they disagree with. 3) Someone who says what they want to hear is better than someone who doesn’t. We cannot allow students to have these issues throughout their life. Not if we want to remain a technic society (I mean humanity here). We need people to question, but more important than questioning is an ability to accept when one is wrong, given sufficient robust evidence. Allowing children to make up their own mind doesn’t aid that. The students are not making up their own mind (even if they think that they are). They don’t have sufficient information or skills and they are being told, by a trusted authority, things that are simply wrong. That’s not how to teach. Very straightforward, not a lot of technical mumbo-jumbo. I think high school biology students could read it and understand it. Of course getting them to do it, especially if they have been brainwashed, is another thing. I think it’s more likely that they will NOT do it as long as they are living with their parents. When they go to college and are a little more mature in their critical thinking skills (hopefully) maybe some would have enough curiosity to question their faith-based beliefs. In high school, the most that can be hoped for is to sow a seed of doubt that might sprout later. have you read “the case for a creator” By Lee Strobel ? Yes, as a matter of fact I have read it, cover to cover. It is a series of interviews of members of the Discovery Institute, founder of the Intelligent Design myth that has been thoroughly debunked. The most credible person on their staff, biochemist Michael Behe, whose “contribution” to the ID idea is the idea of “irreducible complexity” was thoroughly demolished in cross examination in the Kitzmiller v. Dover trial. The judge, a George W. Bush appointee, found that ID is a form of creationism which has no business in any high school science class. Strobel’s whole book is full of such nonsense. Back in my high school days, 60’s, there was simply no question on the intersection of science and religion. Science described how the world worked and religion is something you put up with on Sunday’s so you could have Christmas. My observation is that things began to become murky during the 80’s with the rise of the so-called Moral Majority and the influence of televangelists: 700 Club, Bakker, Falwell and the rest. What used to be the fringe “holy rollers” rebranded themselves as “evangelicals” and “fundamentalists” crossing the line into politics and society in general. It was then that state legislatures, notably Louisiana, enacted legislation intended to violate the establishment clause. Failing in all these attempts, the Christosocial warriors sought subtlety with strategies like “teach the controversy” and “balanced treatment” and “equal treatment” and “teach both sides, let the students decide” all with an express purpose of injection religion in general and creationism specifically into the public school system. And here we are today still dealing with this stuff, wasting our time and money on useless social adventures when there are real problems that have real consequences to deal with. What a world! In order for those unfortunate children who have been bottle-fed creationism on a weekly basis to get the opportunity to make up their own minds, they must first encounter someone willing to teach them the scientific worldview. Without unflinching public science teachers, the purveyors of Sunday School dogma go unchallenged. Where I live, anti-science legislators are taking a “teach the controversy” approach, knowing full well that Sunday School teachers will never have to present both sides of any given issue. In the struggle between scientific and faith-based epistemology, one side is actively trying to tie the hands of the other by manipulating public policy. Even without public policy changes, many high school science teachers are so intimidated, that they barely mention evolution. Wasn’t there some new research to show that 31% of science teachers don’t believe in it? Oops, that might have been about climate change being natural and not man made. I think you’re right. I have read about science teachers in the South who basically don’t discuss Evolution at all, or only in the most disparaging terms. Some even openly promote Creation Science…or Intelligent Design…same thing. Americans United and the ACLU are constantly writing letters to schools who allow this, warning them that they are breaking the law. It’s a constant battle. Wrong like when Ernst Haeckel doctored sketches of embryos of different animals to prove macro evolution? Or how macro evolution is taught as proven when actually only micro evolution is? Most don’t even know the difference due to indoctrination. Imagine that.